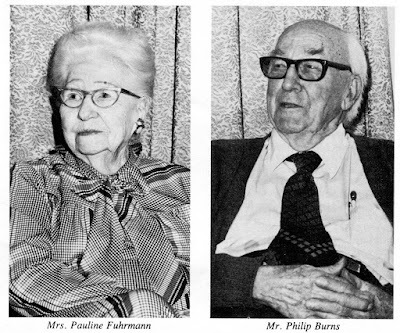 Good times with family, the pioneer spirit and neighborliness during the early 1900's were the topics of discussion in a 1982 conversation with Mrs. Sidney (Pauline) Fuhrmann and Philip Burns. During the interview, they reminisced about what life was like in the community in the early 20th century, and Mrs. Fuhrmann and Mr. Burns, both natives of Covington, were each 90 years of age at the time of the interview. Their recollections were published in the 1982 edition of the Greater Covington Chamber of Commerce annual magazine. Judy Bloom was the editor of the magazine and probably wrote the article, even though there is no byline. 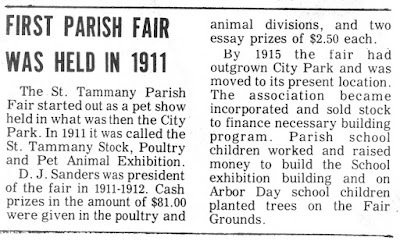 In the article, Mrs. Fuhrmann recalled that her mother, Amy McManus, was from New Orleans. "She came to Covington to spend her summer vacations, and stayed in a boarding house which is now Ida Chapman's home" Mrs. Fuhrmann stated. During one of the visits Mrs. Fuhrmann's mother made to Covington, she met Emile Frederick and as Mrs. Fuhrmann said, "She and Papa became sweethearts. He built the home where the LeGardeurs now live, as a wedding present. It was a lovely, old-fashioned home and all nine of us children were born there." The main way to get to Covington in those days was by schooner. Mrs. Fuhrmann's uncle, Capt. 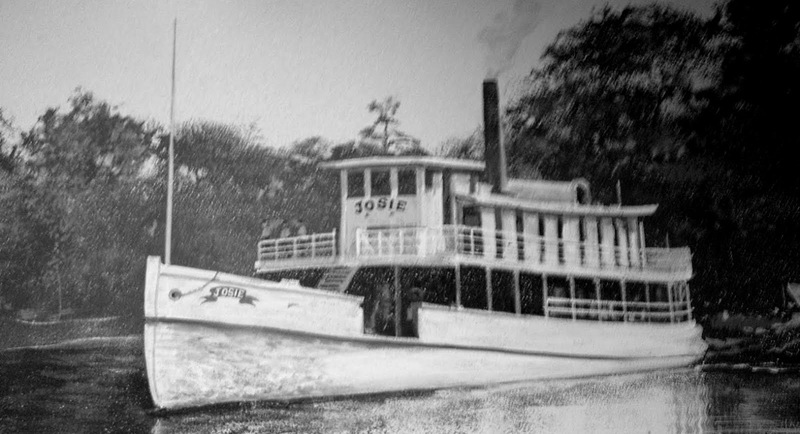 Henry Weaver, built a steamboat named "Josie" after his wife. It was launched from the shipyard in Madisonville, and was the first steamer here. The first paddle-wheeler was named the "Camelia" and was the passenger boat from New Orleans. Mrs. Fuhrmann said, "The wharf was at the foot of Columbia Street, and these boats would come at least once a week and tie up to it. Along with other things that were almost essential to the town, there was always something interesting, like the oyster-monger. You could buy a sack, but many people brought a tin cup and bought them by the dozen for 10 cents. I remember Papa would get huge bunches of bananas and hang them in the shed." "My father's sister was married to Capt. Weaver, and he had the schooner since the only exit was from the Bogue Falaya or Tchefuncta and the steamer Camellia came up only as far as Old Landing." All the cotton had previously been shipped on schooners, but when the Josie was built, it was for freight. It would occasionally take a few passengers. "I went on it once and have never been so seasick in my life!" she recalled. 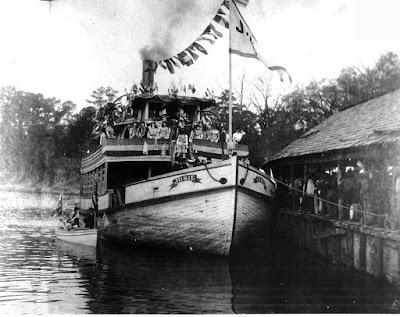 Sometime between 1907-1911 the King of Carnival rode the steamer Josie to Covington and "it was a big time, because we had all of the notables in here," she went to say. Mrs. Fuhrmann met her husband, the late Sidney Fuhrmann, at a Carnival Ball. When asked how they started dating, Mr. Burns interjected, "By playing shy—I had to be around a gal for six months before I could even say 'hi'." Mr. and Mrs. Fuhrmann had three children: the two daughters being Pat Clanton and the late Rosemerry Hanian. Mr. Fuhrmann was a very talented gentleman - a showman and gifted artist. Sidney Fuhrmann organized a dramatic club early in the century - he was the director, usually took the male lead and painted all the backdrops. Most of the plays were held in the pavilion at the park. His painting ability was natural, never having taken a lesson. Nevertheless, he produced some beautiful works in oils, watercolors and pastels. His favorite subject was local woods scenes, especially oak trees. Fuhrmann was in the movie business - he opened his first theatre in 1914. "It was called the Parkview, and was located where Hebert's Drug Store is now," Mrs. Fuhrmann recalled. "A few years later he moved to the site of the First National Bank and opened the Majestic Theatre. There was another one a little further down the street which was called the Deluxe." Then he expanded to Madisonville and Mandeville. "During World War II, my daughters and I drove to Madisonville to run the shows - I can vividly remember little Pat standing on a box to pop the popcorn." Mr. Fuhrmann was a natural actor, comedian and entertainer, and also played the violin and piano. He was affectionately known to everyone as "Sid." 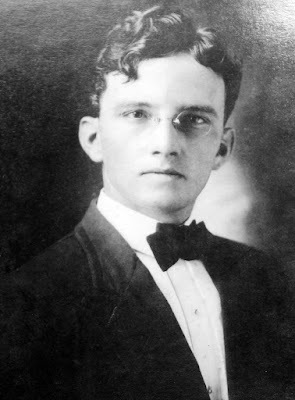 His grandfather, John A. Burn (the "s" wasn't added to Burns until later) and grandmother, Harriet Reddick, established a home and farm. In 1905 Mr. Burns' father, J.C. Burn and his mother, Robna Edgar moved their family into town because his mother insisted the children should attend school here. In 1908 J.C. Burns, along with Owen Burch, opened a successful country store known as the J.C. Burns Company. "We bought cotton, cattle, and all those things. That was part of the way of country life in those days - you traded groceries for cattle, syrup, coal, turpentine, tar, sweet potatoes, etc. Eggs were a big cash item for people out in the woods. In the fall we got paid for what we'd sold out of their cotton and so on, during the year." Mr. Burns completed school here, then moved to Lafayette for a while, but soon returned here to work. After a monetarily discouraging stint working for a bank, something happened which later turned out to be very fortuitous. An older friend stopped him on the street one day and said he was finished with his business and wanted sell it to him and his brother. Mr. Burns said, "Mr. Bourgeois, you must be talking out of your head - how on earth are we going to finance this business?" 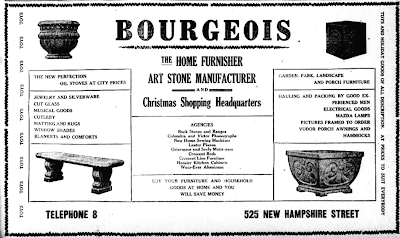 Mr. Bourgeois replied that he'd fix it, and surely enough, he did. 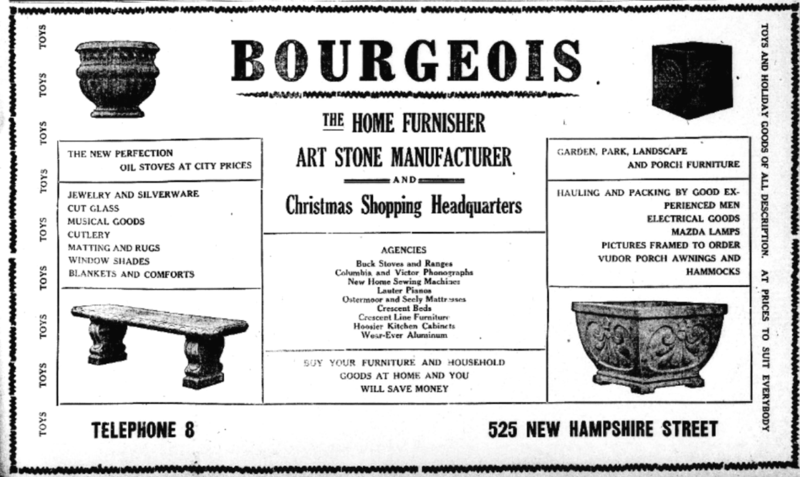 "He went in there and marked off so much furniture and he said 'You'll pay me so much a month, according to how much you sell' and the balance of the furniture he put up on a balcony and said 'You pay me for this as you sell it,' and so, that's how we got into the furniture business." When asked how he met his wife, Mr. Burns smilingly answered, "I was from the wrong side of the tracks, but I got on the right side. Pauline's (Mrs. Fuhrmann) father and mine were close friends and one day they were talking about their children. They decided that Pauline and I should marry, but I couldn't talk Pauline into it. Instead, I married her sister, Ruth. I guess I would have been pretty well off with either sister, but in Ruth I found as good a one as ever put on shoes. We were married 55 years and had four children." When asked about how people spent their leisure time in the early part of the century, Mr. Burns and Mrs. Fuhrmann's noted that Sunday was the day to ride the excursion boat to New Orleans. The Post Office was located in the Southern Hotel, which had a beautiful veranda where the young people could sit and talk while waiting for the mail to be unloaded and the boat ready to depart. Inside the hotel was a ballroom and a parlor where one could dance until time to leave. Almost every afternoon the same group of boys and girls walked to the park, where there was a pavilion. 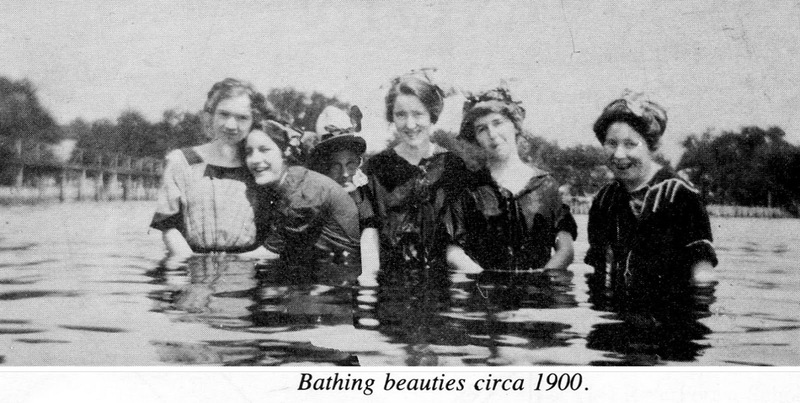 "The park was also very popular for swimming," Mrs. Fuhrmann said. "The park was built around 1907-1908. The pavilion was built so there was space underneath, with a dance floor above. Mr. Burns added, "The first Fair was held there. They decorated the top floor all around the edges and danced in the center. Underneath, were displayed all kinds of farm products. Then sometime between 1910-1916 there was very high water on the river and it washed away the pavilion. "The people of Covington were so proud of their pavilion that they banded together for a Park Day, which turned into two days. Nearly everyone in town went down and retrieved all the lumber that had floated away, shaped it up, and completely rebuilt the pavilion in two days' time. That shows what community effort can do." The Fair was held there for about ten years, then moved to its present location. When the Fair moved it was a big social event - bands played, everyone got all dressed up, and there were lots of school bands. Mrs. Fuhrmann recalled, "All the organizations had booths, food was served, then at night we had dancing. Nearly everyone participated in the Fair in those days. 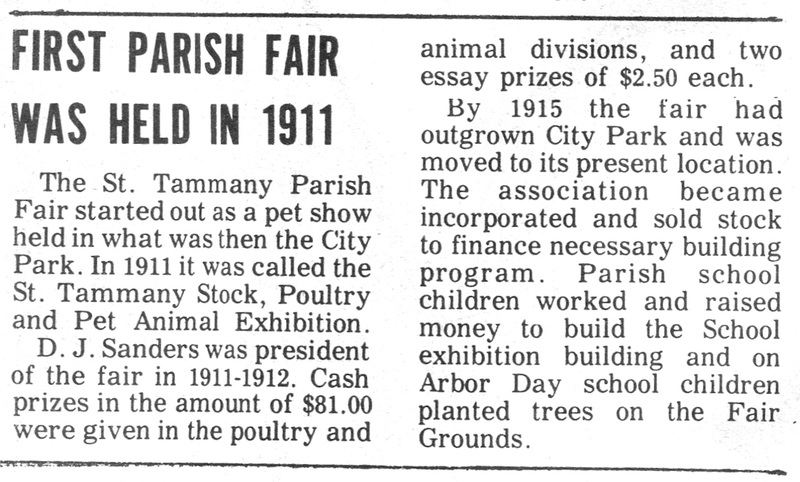 There were exhibits of horses, cattle (Piney Woods kind), plenty of chickens, etc. Every room in the schools at Madisonville, Slidell, Mandeville, etc. had displays in a building built especially for the schools. It was really an honor to show something at the Fair." When asked about the bathing suits of that era, a merry twinkle appeared in both Mr. Burns and Mrs. Fuhrmann's eyes. "We wore long suits with fluted, frilly caps, stockings and some type of bathing slippers," she said. Mr. Burns laughed, "But the boys' suits were the ugliest. I hated them; then when they finally got small like the present day ones, I was so ugly I hated them, too!" Mrs. Fuhrmann told of their camping experiences. "My aunt, Mrs. Weaver, wife of the captain of the steamer Josie, would take a group of boys and girls down on the steamer to go swimming in the lake at a spot beyond Madisonville by the lighthouse. We took tents - one for dining and one for the girls. The boys slept on the sand." Mr. Burns laughed and said, "I slept one whole night on the sand outside the girls' tent, trying to hold Ruth's hand underneath the tent." "We had one switch in the house while we were youngsters that controlled all the lights in the house. When the last person in the house was ready for bed, he pulled the switch, and that was it for everyone." Regarding the medicines of the day, Mrs. Fuhrmann recalled, "Every Spring we had to take a tablespoon of sulphur and molasses, then Grandma made lemonade with cream of tartar and everyone drank that. My husband's mother treated the neighbor's cuts with pine gum. We slept with mosquito bars. I recall being only a little tyke when my ears were pierced with tiny diamond earrings. One night an earring got caught in the mosquito bar, and it was many years before I wore a pierced earring again!" Babies usually were born with the help of midwives. "They had more superstitions than you could write a book on, and so did the people," Mr. Burns recalled. "We sold material to line coffins and make shrouds at the store. Mother made more shrouds and lined more coffins that she could count. Usually, people made their own homemade pine coffins when one was needed." Covington boasted a number of schools in that era. Mrs. Fuhrmann and Mr. Burns remembered, "There was a public school on the location of the present Middle School, and there was another behind were Elsie Galatis now lives. Also, there was a school ran by the nuns right in front of where the American Legion Hall now is. The Garden District School was located on what is now the Millings' place, and of course, there was St. Scholastica." 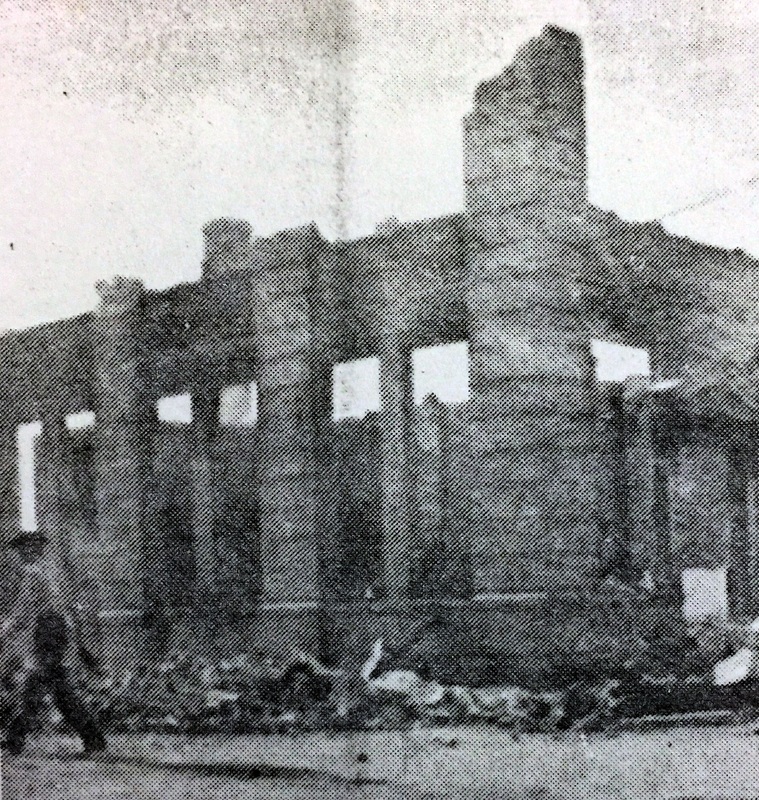 Covington suffered two devastating fires. The first, in 1907, was described by Mr. Burns: "The main part of this fire was at Lockwood and Columbia, and it burned down all the establishments up to what is now the alley by Dutsch and Peters' and everything up to where the present new brick buildings are. It cleaned that square off and stopped at our house, which is where Southern Reflections is now. "We had a huge tree, and that saved our house. We used buckets of water to put out the fire. The next fire was in 1911 and it was on Columbia Street, also. It burned from Boston Street to the river, burning 36 business establishments. Pauline's father had a big brick building around the corner from Boston Street that is now Rykert Toledano's office. The fire began at an Italian fruit stand, and there was an immense dry goods store adjoining it. "It's amazing that no one was killed, because we had only bucket brigades to put out the fire. The water pressure was so low we could hardly use it. The story is told that the reason for this was because the train had just come into town and filled its tanks, making the water pressure in the area too low to fight that kind of fire." 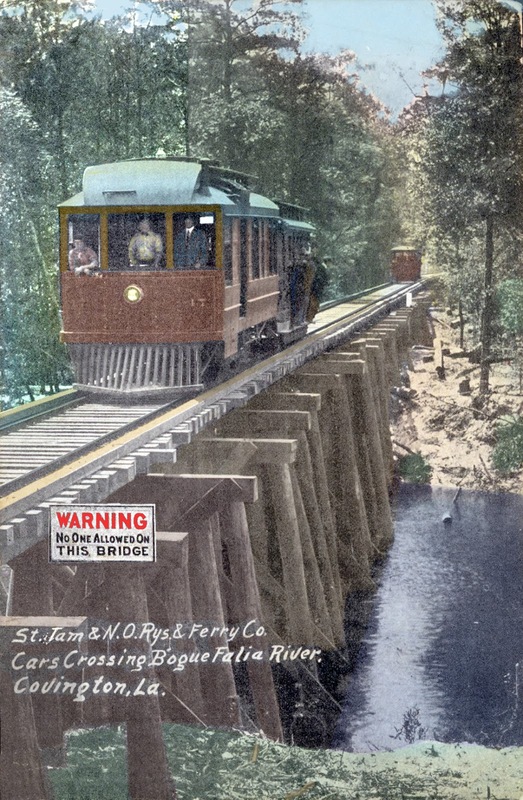 Sometime in the early 1900's a railroad line was built which went from Covington to Mandeville, going through Abita Springs. Called the "Doodlebug", the first one ran on gas, then a later one was electric. The depot was on the site of the present City Hall (police station). This car ran several trips a day to meet the boats that landed in Mandeville to go to New Orleans. It was a very pleasant outing for young people because big excursions came from New Orleans to Mandeville on weekends. Mr. Burns explained, "It was a good way to spend an hour and a half with your girl and enjoy the good music the people on the excursion had. We'd go to Mandeville, then ride the boat over to New Orleans and come right back. There was a big wooden walkway on the beach in Mandeville so people could walk right out on it into the boats. There was a bad accident one day when the dock collapsed and lots of people fell into the water. Captain Weaver's son, Dudley, and a couple of other men were real heroes that day because they pulled 100-150 people out of the water and got them to shore." Covington in those days didn't look quite the same as it does today (1982). The streets were mud, and wagons and carts frequently got bogged down. "Then the Jahnckes started dredging the lake and brought in shells and put them on Louisiana Avenue," Mr. Burns reported. "Because the shells made the street so much nicer, it was re-named Jahncke Avenue. It was a main street because it went down to the landing. Eventually, shells were spread on other streets. All the streets had deep ditches and everyone who was able had curbing of cement, bricks, or whatever." Covington's first car arrived around 1900-1905 and Dr. Pettit created quite a sensation driving around town." "There was a mixture of homes and businesses in the downtown area. 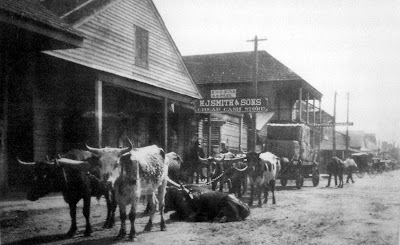 Where the First Bank (Gulf Coast Bank) now is was the Bradley's home, and where the Southern Hotel is, some of the Smiths had a home. In the backyard of A.J. Smith's and Sons is a nice-looking building which is their old house. These are pioneer people -Smiths, Bradleys, Burtons, Fredericks, Planches, Burns, etc., and a lot of their descendants are still around," Mr. Burns commented. Covington's unique ox-lots in the Division of St. John must have been quite a sight. Both Mrs. Fuhrmann and Mr. Burns recalled seeing big teams of double-yoked oxen bringing in bales of cotton. They would get tired and just lie down in the ox lots. The men sometimes had no place else to go, so they would sleep there, too. Covington was a natural trade center for a large surrounding area because of being able to ship material on the boats. In the 1900-1910 era, the streets were pretty well loaded with oxen and mule teams bringing in produce to ship. The main crops raised were rice, cotton, sugar cane, sweet potatoes, white potatoes, corn. The main industry in the early days was from the pine trees. 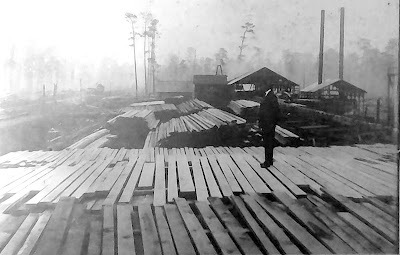 Resin and charcoal were obtained from the trees, and around 1900 several saw mills were built so that timber and lumber got to be a big industry. In summing up their recollections, Mr. Burns said, "There has been an immense change in our time from when you didn't have very much, and you didn't worry about not having much - you were satisfied with a little. You were satisfied to make your existence and your pleasure. It was a time when everyone knew everyone else and there were close ties. It was so easy to be friendly; to assist people if they needed it. We created everything for our children and ourselves. "Children seemed to have so much more to play with, and they made up all the games themselves, like balls, marbles, hopscotch. Children today have the knowledge of textbooks, but don't know how to do the basics, like painting, building, taking care of themselves." Mrs. Fuhrmann commented that "The changes have been incredible over a 90-year period. I have lived this length of time here and loved every minute of it. I don't think it could have been any better. . .it's been very satisfying. Lots of people have said I'm too satisfied and could have gone someplace else, but I don't believe that. Advancements come wherever you are. Most people do think home base is dear, and want to call someplace home." Mr. Burns spoke of his hopes for the future of Covington, saying, "I might wish it to go back to a little country town, but that can't be. We need to have some commercial activity and manufacturing, but I don't want to see us growing too big. Covington is too pretty, too unique, to destroy what nature has given us." Mrs. Fuhrmann closed by commenting, "I miss the closeness we used to have, but wouldn't want anything to interfere with progress. There's always been an air of culture and refinement here - something 'different,' and I hope there always will be."